Chasin' Mason: [Fall Scarf Exchange] Goodies Revealed! The weather has finally started to feel like Fall around here and I could not be happier! 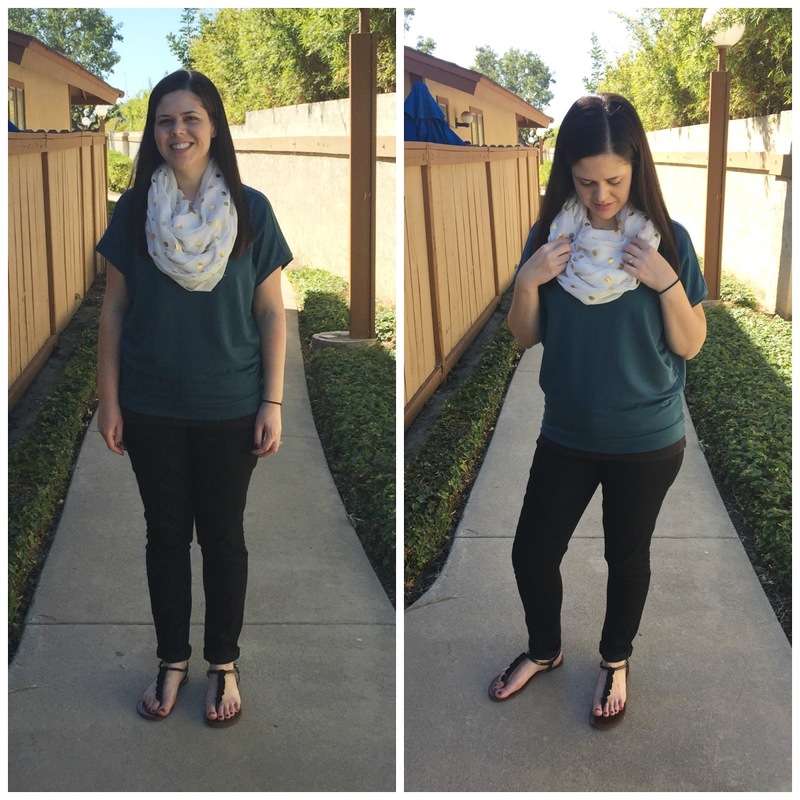 With colder temperatures come warmer outfits and with it... scarves! Seriously I don't know what happened to me, but last week it must have been 70 degrees and I thought it was freezing! I guess that's what weeks of 90+ and 100+ degree temperatures will do for you. Regardless, I'm pretty excited about cooler weather! Which brings me to the day I've been waiting for since we announced this scarf exchange - scarf reveal day! I'm so excited to see what everyone got, but I'm also really excited to share what I got! I was partnered with Erin. We exchanged a few emails but for the most part I was super surprised when my package arrived on my doorstep. When I opened the box, I was greeted with the cutest wrapping with some pineapple tissue paper. And when I opened the tissue paper, I saw that she had sent me a really gorgeous scarf! 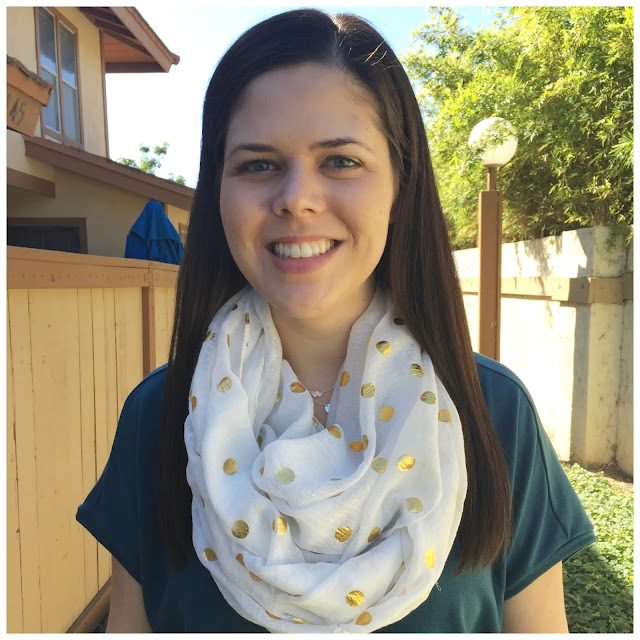 The scarf was white with gold polka dots and I was really excited about it because I don't have anything at all like it! My partner was Sarah. We exchanged a few emails, I found out her likes and dislikes, and was able to find her something that I thought she would really love. She told me that if I wanted to get her something to coordinate more with outfits, then she would want something solid. She tended to wear a lot of patterns and would prefer something solid to go with whatever top she was wearing. Check out her Instagram to see what I sent her! I think I found something that could coordinate well and that was still fun and cute too! Thank you so much to everyone who participated in our scarf exchange! 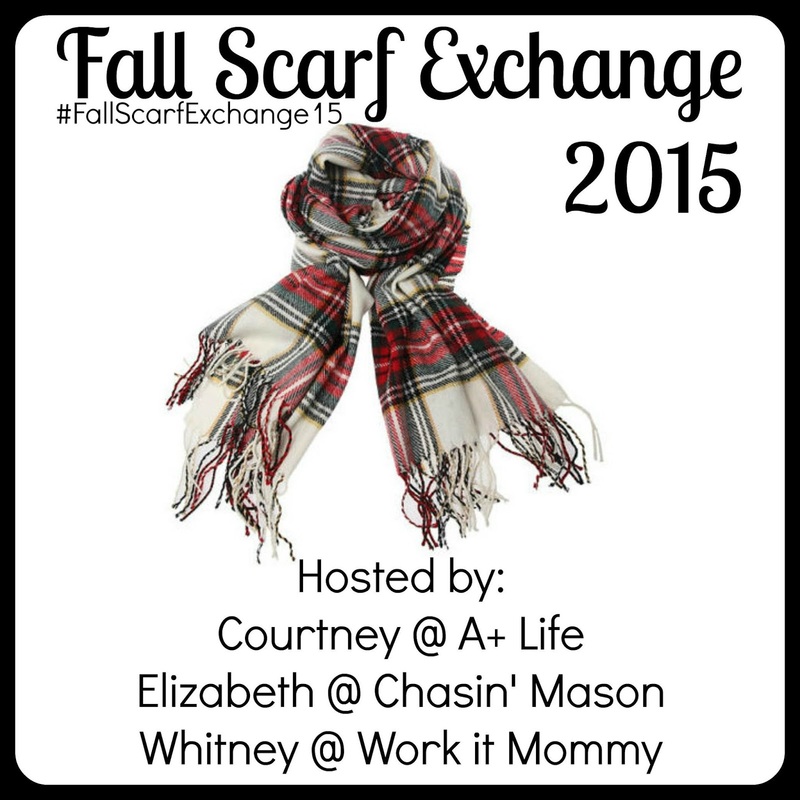 Don't forget to link up and show us the goodies that you got! I love the gold polka dots!! It reminds me of my screensaver in my computer! So cute! That scarf is TOO adorable!! This is my favorite blogger exchange to date! Scarves are just so much fun! I love your scarf! It seems perfect for someone living in balmy CA and the gold polka dots are super trendy right now! Thanks to you and the other girls for organizing this exchange!! Please make it an annual thing?!?!?!?! That scarf is awesome! I love it! Polka dots are all the rage lately. Oooh, love the gold. I've never seen a scarf like that one. It looks great!! I am OBSESSED with that scarf!! It's awesome! I love love love the one I received too! Such a great swap! Thanks for organizing! Your scarf might be my favorite of them all! You know how I have a gold + polka dot problem. And this weekend is supposed to be back up around 80° - ugh!!!! That is a gorgeous scarf! I bet you'll get a ton of wear out of it! I love the one you got Sarah! She is a college friend of mine and a high school friend of Russ! :) Boom! World's collide! Ooh love that scarf! Perfect for California! i really really love your scarf and your stylish skinnies. you're adorable. thanks for hosting the swap. i loved it. Cute scarf! 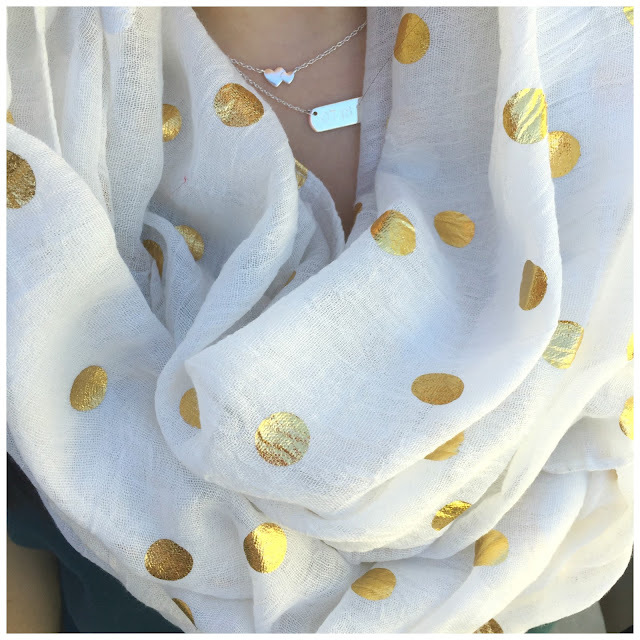 The gold dots would work well around the holidays for a little sparkle! This one is my fave of the scarves I've seen from the exchange!! It's so pretty. All the pretties. Can't go wrong with gold dots. Oh Liz, you're so cute and I love the gold dots on you!! I'm sad I didn't participate! ! ! I'm in LOVE with your scarf, I need to know where it's from because I NEED it in my closet asap! And thanks so much for hosting another fun box swap!!! Love the gold polka dots such a fun touch to add. I keep seeing gold polka dots lately too. SO apparently your totally on trend in that scarf. I am SO not a fashion blogger either :).